I am trying to figure out how to make this cookie, and I'm stumped. It's from Bernunzio's Deli in Penfield, which is my favorite deli in Penfield. 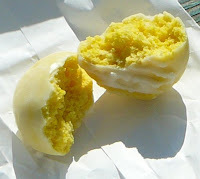 They call it a Lemon Meatball Cookie. This cookie also comes in vanilla and chocolate, but I like lemon the best. 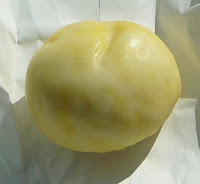 It is lemony and so tender that it almost melts in your mouth. It's not chewy, like a chocolate chip cookie. It's not dry and crumbly, like a buttery almond crescent. It's not caky and spongy either. I guess it's a cross between crumbly and caky. I've tried Googling "meatball cookies" but all it turns up is a cookie with chocolate chips and nuts. I have plenty of those kinds of recipes. I want lemon! I have a hunch this recipe could start with some kind of a mix, like perhaps a cake mix, because of its unnatural yellow color. So for Fathers Day, I was going to give my husband a clean house. A week later, guess what -- it's still not perfectly clean. But I have to resign myself that it's not going to happen for awhile and get back to blogging. On Fathers Day, my husband slept in. While we were having breakfast, he opened his gifts. My sons proudly gave him a card they had made together. They had worked together on the card with the door closed for at least an hour the day before (it was bliss). It was a booklet of letter-size paper, folded in half, and looked like a series of cartoons. 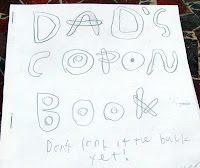 As my husband looked at it, he saw that it really was a coupon book (as you can see, they aren't the world's greatest spellers). "Clean our rooms," my husband read with surprise. My eyebrows shot up to my hairline, because getting my sons to clean their rooms verges on the impossible. I've tried cajoling, threatening and even bribing. All it took was Fathers Day? "Clean a bathroom," he read, and my eyes got wider. My sons stood there with huge smiles on their faces. "Dust the living room," my husband read. I was flabbergasted. It was like I went to bed with my kids and woke up with kids that were straight out of Family Fun magazine. You know -- the ones who ask for money for orphans in Africa instead of presents at their birthday parties. I was always convinced those kids would wind up in therapy ... "my Mom convinced me to have donations sent to the orphans in Africa ... I really wanted baseball cards, but I couldn't admit that to her because she'd think I was selfish ... ever since then I haven't been able to speak up for my own wants and needs..." Well, those children WERE real! And they were MINE! All my lectures about kindness and thoughtfulness -- not to mention my own shining example -- had finally sunk in! "Wait, what's this small writing ...," my husband said. "Not valid on days ending in "y," he read, as my sons started to chuckle. "Expires June 14," he read as they laughed harder. "Not valid on any state that we're in," he read as they just about rolled on the ground. At any rate, I attempted to be thoughtful. I wanted to start the day with a special breakfast, and I was stumped -- until my husband recalled, for the ump-teenth time the wonderful donuts we had been served at a party at one of Wolfgang Puck's restaurants. It was 2004 and we were in Hollywood for the Pillsbury Bake-off contest. Sherry Yard made an appearance -- and I missed her! But those were the best dang donuts we had ever had -- warm, sugary spicy, and melt-in-your-mouth. Shortly after that, I bought The Secrets of Baking, and although I've referred to it from time to time, I haven't actually made a recipe out of it. I decided to start with her Brioche Donuts. I used the Food Blog search (on my sidebar) to see if any food blogger had made them. Sure enough, Tanna from My Kitchen in Half Cups had made them and raved about how delicious they were. That made me confident to try them myself. I made the dough and let it rise on Saturday evening. I popped it into the fridge, where it had its second rising. On Fathers Day morning, I let it sit at room temperature for about 15 minutes, then rolled, cut and fried the dough. It was easier than I expected, and the donuts were tasty. My husband (and the whole family) enjoyed them -- BUT -- they weren't the donuts we remembered from the restaurant! Bummer! I've seen recipes for Sherry Yard's Buttermilk Donuts floating around the internet. Maybe those are the donuts we remembered, so I may have to try those next. 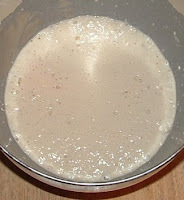 Sponge: Combine the yeast and milk in the bowl of a standing mixer fitted with the paddle attachment and whisk until the yeast is dissolved. Let stand for 5 minutes, then stir in the flour and brown sugar, forming a (relatively) thick batter. Cover with plastic film and let rest at room temperature for 30-45 minutes, or until bubbles form. 1. Add the flour, salt, cardamom and cinnamon to the sponge, then add the eggs. Mix on low speed for 2 minutes, or until the eggs are absorbed. Switch to the dough hook, increase the speed to medium (#4 on my Kitchenaid) and knead the dough for 5 minutes, or until the dough begins to slap around. 5. Turn the dough out onto a lightly floured work surface. Using a rolling pin with handles, roll it out to a thickness of 1/2 inch. If the dough is difficult to handle after rolling, place it in the freezer for 20 minutes. Cut the dough using a donut cutter or two round cutters of graduated size. Dip the cutters in flour each time to make it easier. 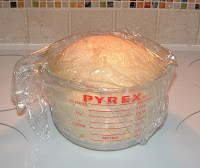 Once cut, the dough can be stored in the freezer for up to 1 week. Defrost in the refrigerator and let sit at room temperature for 10 to 15 minutes before frying. 6. Heat the oil in a heavy skillet, wide, heavy saucepan, or deep fryer over medium heat. Insert a candy thermometer. When the oil reaches 350 to 360, carefully place 4 or 5 doughnuts in the oil. Fry for 1 minute, then use a slotted spoon to flip them over carefully. Fry the other sides for 1 minute, then flip the doughnuts again and fry for 30 seconds more, or until dark golden brown. Remove the doughnuts from the oil and drain them on paper for 30 seconds before coating them with the sugar. 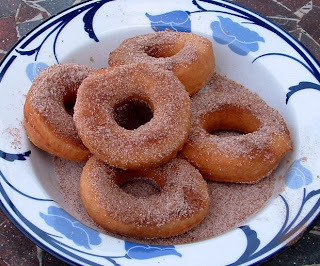 (I found the cinnamon & sugar coated the donuts better if they were tossed in the cinnamon & sugar right after frying. If you don't want cinnamon & sugar, put the doughnuts on a rack and drizzle with the glaze.) Repeat with the remaining doughnuts. Serve immediately. Fried doughnuts stay fresh for only about 2 hours. To all the dads out there, happy Fathers Day! I have a long road ahead of me, so no blogging this weekend! Have a good one! I haven't had time to write anything about Top Chef this week, but I'll try to jot down a few notes before the finale on Wednesday! In the meantime, this was a quick, tasty and healthy dinner from a cooking contest buddy. We beat the Ralstons in a cookie contest in 2006, and they beat us in The National Beef Cook-off in 2007. I like the Ralstons so I hope the two families will meet again to break the tie -- although we'd actually have to enter a contest to make that happen! We've been much to busy to do so lately. I don't have a lot of success broiling beef and this recipe was no exception. I don't know what I do wrong, but it came out a bit chewy. I loved the unusual salsa, though. I would never have thought of putting those ingredients together, but I thought the salsa was not only colorful but also refreshing. It was a nice complement to the beef. I haven't had a chance to submit anything to the ARF/5-A-Day weekly event at Sweetnicks in awhile, so I'm doing so today. Check out Cate's blog each Tuesday for great recipes that help you get your daily fruits and veggies! 1. Combine Pineapple Salsa ingredients and set aside. 2. Combine ketchup and hoisin sauce in another small bowl; set aside. Cut beef steak into 1-inch pieces. Thread beef evenly onto four 10- to 12-inch metal skewers. Season evenly with pepper. 3. Place kabobs on rack in broiler pan so surface of beef is 3 to 4 inches from heat. Brush beef generously with some of reserved sauce mixture. Broil 7 to 9 minutes for medium rare to medium doneness, turning once and brushing with remaining sauce mixture. Season beef with salt, if desired. 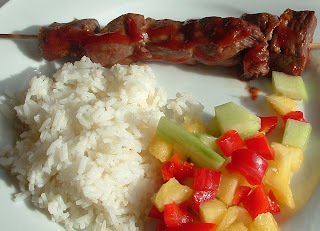 Serve kabobs topped with pineapple salsa. Makes 4 servings. I'm not good at receiving compliments. CRB had a gig on Friday night and although the band played well, I wasn't at my personal best. My throat had been bothering me for a few days so I didn't feel like my voice was sounding good. In addition, we had trouble with sound, which made it hard for me to hear myself or the other vocals, so I felt unsure of what I was singing. All of this rattled me, and I made some mistakes that I don't normally make. By the end of the first set, I was feeling down on myself. When we took a break, a man walked up to me. Intellectually, I know what to do in these situations. If it were my kids, I would have told them, "say thank you to the nice man." Instead, the following thoughts ran through my brain: Why are you saying this to me? Do I sound so terrible tonight that you are saying that out of pity? Are you a friend of someone I know, who put you up to saying that? I literally have no recollection of saying anything in reply to his kind words. I HOPE I at least muttered thank you. I WISH I had explained that I prefer singing harmonies. I WORRY that I just gave him a blank stare. In the same vein, my blog has received some nice compliments over the past few weeks and my usual inability to deal with these things made me procrastinate posting about them. To make up for my lack of graciousness with that man on Friday night, I'm going to put aside my insecurities and say some thanks. Julie is a fellow Rochester blogger. There are a handful of us -- one of these days I'm going to get the Rochester food bloggers together so we can meet (and eat). Julie tends to write about food from "the good old days." I like that about her. The rules, according to Julie: You have to choose 10 more blogs of any kind which you deem to be excellent. It’s tough to choose since there are so many excellent blogs out there but limit we must. I’m sure over time all of those deserving bloggers will be awarded. This was a real problem for me, because I don't like to choose favorites. I thought I'd recognize some promising relatively new blogs, not all of which are dedicated to food. 1. Karin from Artful Crafts. Karin is a good friend who used to live in Rochester and now lives in Wisconsin. She is very creative, and is the author of two new craft books, Altered You and Mostly Metals. Her blog is about inspiration and creativity. She's a really good cook, though, and I hope she posts a recipe from time to time! She is actually the person who influenced me to use recipes as a guideline, not an absolute. 2. Michele from No Frigate. Michele is an attorney, lives in New York City, and happens to be my cousin. She and her husband are interesting people who I'd like to know better. They recently spent a year working in India, and she sent home colorful dispatches of her time there. Her blog is mostly about the books she's reading; she recently reviewed The Omnivore's Dilemma, which is on my reading list. Michele is the person who convinced me to start a blog! 3. Amy from Baked Alaska. I like a food blogger that will write about her failures and she does so, with good humor. Amy is currently living in a part of Alaska that is without electric power, which I find mind boggling! 4. Elisabeth from Cooking in Cathedral Hill. Like me, she has a regional focus, but she's in St. Paul, Minnesota. Her recipes are not too ordinary, not too fancy -- just right. 5. Shannon from Writing As I Eat. Shannon is a cooking contest buddy who has returned to blogging after a hiatus. The blog captures her personality. I like that she doesn't only write about cooking, and that she's not a food snob! 6. Veronica from Supermarket Serenade. She is another contest buddy who is also doing a great job with her new blog! She focuses on great finds from the supermarket, which is a good twist on the food blog theme. 7. Erin from Prudence Pennywise is yet another contest buddy. Her blog's theme is cooking frugally -- something we could all use with the way gas prices are rising. I can't decide if I love or hate the music she plays on the blog! 8. Julie from My 45th Year. She is a Rochester blogger who decided to set some goals for her 45th year: finishing 45 hand-made objects, completing at least one 45-hour solo retreat, and biking 45 miles in one day -- and blogging her progress toward those goals. Now that she's turned 45, she started a new blog, Hand Crafted Life. I'm sure that blog will be as good as her first one. 9. Tracy from Kitchen Spark. Her name is Tracy, she's the mother of two boys, and she's trying to progress from tater tots and fish sticks. I think she's my soul sister! 10. Laura from The Spiced Life. She is a fellow poster on the Cooking Light Bulletin Board, and some cool out-of-the-ordinary recipes. WHEW! I'm exhausted! But wait ... there's more! 1. Lis from La Mia Cucina. She's one of the people who initiated the Daring Bakers, which is getting to be an enormous group on the Web. But her writing is hilarious. I feel like I know her. 3. Catherine from The Dish. Her blog is about food. And it's funny. What more could you want in a blog? Thank you to Lisa from Jersey Girl Cooks for the Arte de Pico award! Lisa is a fellow cooking contest hobbyist. She's been blogging for a couple of months and is doing a great job! She recognized five bloggers for this award. Before I do the same, I'd like to mention that I really do read all of the blogs I have listed in my blogrolls. I deliberately keep the list culled to my favorites. So I'd prefer to honor them all. Instead, I'll pass the award onto my top five "go to" blogs -- mostly because their consistency of posting, good recipes and great photography. I'm too tired to gush about it each one individually. I think their blogs speak for themselves. Whew! Now do you think I have to tell all those people I recognized them? This thanking business is a lot of work. Maybe I should go back to blank stares. I mentioned awhile back that I belong to a Cooking Light group. We meet every month or so for a relatively healthy meal, and everyone contributes a dish or wine. The hostess picks the theme, and for the most recent dinner I attended, Kara chose to go Italian. Usually I walk away with one or two recipes I'd make again, but with this menu, every recipe was a keeper. It was one of our best dinners ever.. The main course, Filet Mignon with Balsamic Syrup and Goat Cheese had the deliciously contrasting flavors of a sweet balsamic syrup and a tangy goat cheese. I've grown to like Brussels sprouts, and especially like the addition of smoky, crispy prosciutto in Brussels Sprouts with Crisp Prosciutto. The Baked Risotto with Asparagus, Spinach and Parmesan was great comfort food -- and baking the risotto makes it easier than traditional risotto. My rosemary bread recipe needed tweaking, but it came together in a flash in the food processor. And the Italian Cream Cake is one of my favorite cakes -- it's moist, buttery, nutty and not too sweet. The only thing I don't like about the recipe is that Cooking Light says it makes 20 servings. As Chrissy would say, yeah, right. Cook Brussels sprouts in boiling water 3 minutes or until crisp- tender; drain. Heat a large nonstick skillet over medium heat; add prosciutto. Cook 6 minutes or until crisp, stirring occasionally. Remove from pan; set aside. Heat pan coated with cooking spray over medium-high heat. Add Brussels sprouts; sauté 3 minutes or until lightly browned. Add butter, salt, and pepper, stirring until butter melts. Remove from heat; drizzle with juice. Add prosciutto; toss to combine. Nancy doubled the recipe, and added another 1/2 cup of broth. She also added the cup of white wine before the spinach and broth, then let the liquid be absorbed before adding the next ingredients. Prepare Cream Cheese Icing (below); cover and chill. Combine sugar and butter in a large bowl; beat at medium speed of a mixer until well-blended. Add egg yolks, 1 at a time, beating well after each addition. Combine 2 cups flour and baking soda; stir well. Add flour mixture to creamed mixture alternately with buttermilk, beginning and ending with flour mixture. Stir in pecans and extracts. Place 1 cake layer on a plate, and spread with 2/3 cup Cream Cheese Icing; top with another cake layer. Repeat with 2/3 cup icing and remaining layer, ending with cake. Spread remaining icing over cake.